To say that I love technology would be a bit of an understatement. These are all of the smartphones that I have owned or currently own: HTC Touch Pro2, HTC Droid Eris, Motorola Droid, Motorola Droid 2, iPhone 4, HTC Droid Incredible, iPhone 4S, Palm Pre 2, and HTC Trophy. 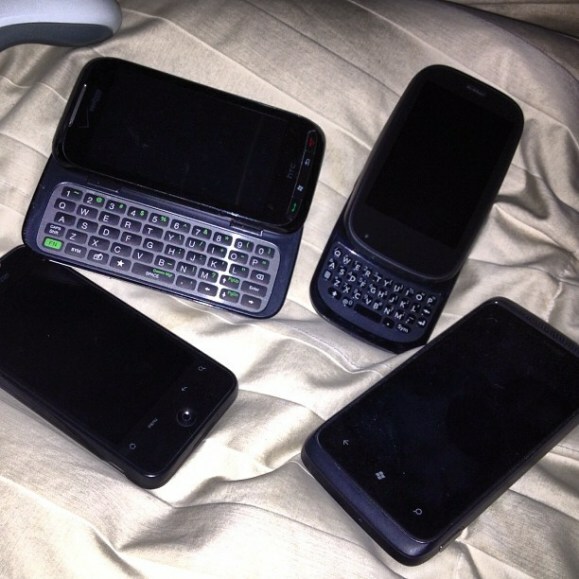 One Windows Mobile phone, one Windows Phone 7 phone, four Android phones, two iOS phones, and one webOS phone. I grew up playing the NES, Sega Genesis, Gameboy, Playstation, Playstation 2, and now the Xbox 360. I’ve owned a Dell Dimension laptop, an iMac, a Dell Vostro 220, and an ASUS eeePC. At work I use a MacBook Pro running OS X on one desktop and Windows Server 2008 R2 on the other desktop. It’s not just that I own a smartphone or that I grew up with computers; I love technology. From the lists above you can also tell that I don’t just love a certain company, I love all sorts of technology. With my own hard earned money I’ve purchased expensive devices on and off contract. I work with Macs and PCs every day at work. I play casual games on my phone and heavier games on my Xbox, but every once in a while I think about breaking out the PS2 to relive the glory days of Cool Borders 2 with my brother or hogging the PS1 to play through Final Fantasy VIII (which is better than VII, of course). Having seen how much time and money I’ve invested into all sorts of technology, you can imagine how frustrating it is for someone to tell me that I don’t understand technology or that I’m a fanboy of one thing or another. Not only do I spend much of my free time writing about and playing with technology, but I make a living working on computers. Like every human I have preferences, but I’ve still worked with a variety of devices from sundry companies. I’ve had people assume that since I wrote something critical of Windows Phone then I must not have used any Windows Phone devices. Once I point out that I reviewed two different devices and own a Trophy they usually never reply. I’ve written articles that are critical of Android, so I’m accused of being an iOS fanboy. I’ve written articles here that are in defense of Android as a platform and still I’m told that I’m an idiot and a fanboy of Apple or Microsoft. There’s a guy in our chat saying, “You are Apple fanboys.” It’s like, in what way are we Apple fanboys? First off, why do I have to be a fanboy? This is what I can’t understand. You’re so freaking pedantic. Why do you have to be a fanboy if you use something? This computer is just a computer. It doesn’t say anything about me as a human being. And I don’t think that it does. I mean, I have a Galaxy Nexus in my pocket. I wish people could understand the words that we use, because you don’t know what a fanboy is. If you think I’m a fanboy, you don’t understand how to use words. And that is what’s so crazy to me. You know what? I am a fanboy. No, I am a fanboy. Everybody at The Verge is a fanboy. We’re fanboys of good [technology]. We like technology that works really well. Five weeks later Josh again returned to the accusations that he and his staff were fanboys with a personal hatred of Microsoft, saying, “What I regret is people’s lack of subtlety. What I regret is the level of ignorance that exists on the Internet.” These words have haunted me. So many people have bought into the lie that if you like something about a product or use it, you must be a fanboy. So many people think that if I have an iPhone then I must love everything that Apple does. If I use Chrome then I must believe that Google offers the best products and ecosystem. If I like Outlook then I obviously can’t get along without Windows. In reality I love things about Microsoft, Google, and Apple, but I also really hate some of their products too. Like Josh said, too many people lack subtlety. Too many people think that they have to buy into everything that Google does if they get an Android phone. Even more disturbingly, some people become emotionally distraught and upset if someone criticizes the product they use. I’ve seen people react to criticism of a phone as though I’d murdered their dog or spit in their face. Those sorts of vitriolic reactions aren’t healthy. I know that this post won’t stop anything, but I hope it reminds people that everyone is different. We all have different preferences. Just because I criticize something about a product doesn’t mean that I’m trying to attack you or your preferences. You like your $200 Kindle Fire? Great. I think it’s a terrible product, but that doesn’t mean that it isn’t great for you. It just means that I don’t like it, not that I murdered your family. We all have preferences and opinions, but if you can’t share them and discuss them civilly, please don’t talk to other humans. Recognize that just because someone uses a product, that doesn’t change the fact that they’re a human who might love some things about it and hate other things about it. There is subtlety in everyone’s choices and preferences. The sooner we realize that, the sooner we can engage in healthy debate and conversation. Here at Droid-Life we’re a community of humans who love Android, but none of us love Android for the exact same reasons. At the same time many have issues with parts of Android. In the midst of our own community we don’t all agree about what is the best thing about Android or the worst thing, because we’re all different. Each of us has different needs and different desires. Each of us has different preferences. Don’t buy into the idea that you have to like everything about a product or that your allegiance to one company and one ecosystem is necessarily a good thing. Google is a fantastic company, but that doesn’t mean that they’ve figured everything out. The same can be said about Apple and Microsoft. Don’t fall for the lie that you have to buy into one ecosystem and choose sides; you don’t. Sure, choosing an ecosystem can influence the future of mobile, but it’s not the only way. Most of us live in multiple ecosystems because no company can or should provide everything we need. Droid-Life’s focus is on Android, but that doesn’t mean we have to pick sides. Just because we love one thing doesn’t mean we have to hate another. Recognize that everyone has different preferences and different needs. Acknowledge that it’s okay if someone doesn’t like the things that you like. If you’re going to be a fanboy, be a fanboy of good technology.